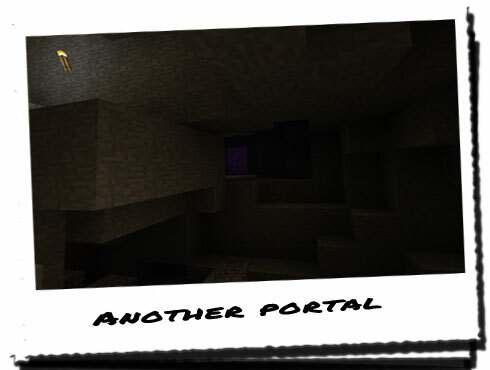 More portals? But the map only indicated that there was only one here. We've already found three and a broken one. Unless... Unless the creator of this map indicated any location with multiple portals as a single point on the map. Well, THEROS had put the locations physically onto the map, but the coordinates only seemed to indicate one. Maybe that's how this person documented them. Any more information would be dangerous to note down, maybe even when translated into Latin and encoded with the pig-pen cipher. "Positive. It's still glowing, so either there's one still in this cave, or there's another very close by somewhere else. Judging from the map, the next closest one is off to the South, outside the snowy area, and I doubt the stone is picking that up." "Alright, we need to continue looking." "Erm... How do we get through that...?" "I don't know. I don't think it's through there..."
THEROS turned around and went back the way he had come. But he only went a few steps, before turning to the left and heading down a previously hidden passage. Following him, UOPETA helped to light the way ahead, revealing a large fall with a thin walkway going around to the left and leading down. Carefully, and one by one, we went over the thin walkway, and reached the bottom. THEROS took a moment to acclimatise himself, before heading under the walkway and continuing along. But it wasn't long before we spotted the portal. Well, we heard it before we saw it, and from this distance, we were able to make out that it was our second secondary portal of the journey so far! Getting over to the portal, THEROS destroyed it with the stone; the portal collapsed into the rift slowly, before dropping us all into absolute darkness. The striking sound as UOPETA lit another torch, and then we were once again bathed in the warm glow. "Now what? Are there any more portals here, or can we move on?" "We have to wait until the stone regains its energy before we can determine that." We waited as the glowing stone regained its energy, hoping it would settle at its usual intensity, but instead it continued to grow brighter and brighter, far in excess of it's usual hue. "Looks like there are more about." THEROS led the way, using the stone as a guide to lead us all to the precise location. It hadn't occurred to any of us to use the stone in this manner before, despite the almost glaringly obvious use it possessed other than destroying the portals. There were multiple paths leading back from the walkway, but even from a distance, we could tell they ended with a large wall. There was no way the portals would be down there. THEROS went down the only remaining passage, carefully going down a set of stairs, where from the top we could see the base of the portal, see it's eerie purple glow and hear the odd sounds they emit. "And that's another one... With the size of this place, how many more do you reckon there are down here...?" "I don't know, I couldn't guess even if I wanted to. We'll just have to wait and see what the stone does after this portal is removed." UOPETA took the stone from THEROS's hands and placed it upon the base of the portal before joining us at the top of the stairs; ever since that Creeper had emerged from the portal midway through its destruction, destroying the Solus stone, we had stood well away from the portal during the destruction phase. We now played the waiting game, watching the stone grow in intensity, wondering whether we had more searching to do. But the glowing seemed to settle at a lower intensity than it had previously. "Looks like we're done here..."
"Good job we used those torches to light our way. We can use them to find our way back." Putting the stone away, THEROS led the way back up and out of the cave. To make it look as though we had never been here, we removed each of the torches as we went. We would likely need them in the future anyway, and there was no sense in making more if we could simply reuse the same ones. After going past the walls where the first set of portals had been, we continued along up the entrance, expecting to see a large amount of light greeting us. Instead, we were met with a cold wind blowing in through the entrance, and a diminishing light. "We weren't down there that long were we...?" 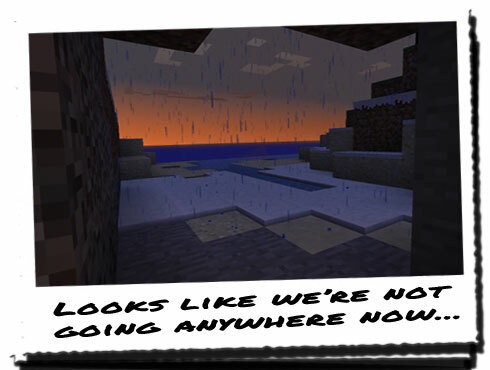 "It looks like we were... Might as well head back in. We're not going anywhere now."